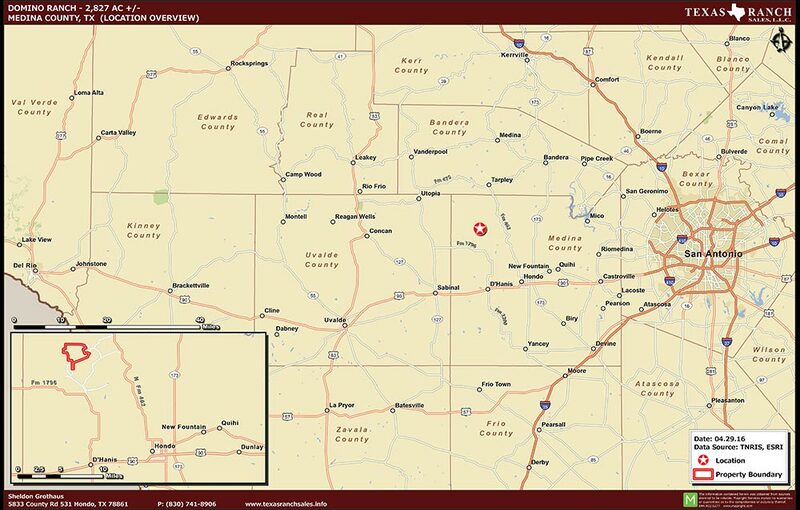 This Medina County Ranch is approximately 14 miles north of Hondo, TX and can be accessed off of FM 462 north of Hondo and all-weather County Road 232 or paved FM 1796 and approximately 4 miles on a limestone all-weather County Road. An all-weather blacktop private road meanders through huge oaks from the main entry to the headquarters. 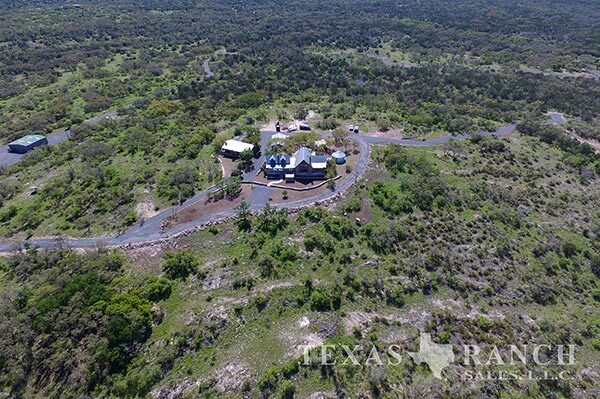 Being in the Hill Country area between South Texas Brush Country and the Hill Country, the ranch features beautiful rolling terrain and million dollar views from the higher elevations with giant live oaks, mature cedars and great deer brush. The property is tucked privately away among the incredible picturesque landscape offering the ultimate package of relaxation and recreational enjoyment. The ranch is game-fenced into 3 separate pastures with approximately 14 miles of all weather blacktop roads meandering through the property. Beautiful native landscape and giant live oaks encompass almost 90% of the ranch, with the remaining 10% being well manicured and organized pastures. Domino Ranch has had superior soil and water conservation practices, and has worked with SAWS to create a sustainable ranch land for both plant and animal populations. Native grasses have been expertly managed for optimum growth to provide forage for wildlife and livestock grazing. Heavy hardwood areas provide cover for all wildlife and game. The ranch offers incredibly diverse terrain and landscapes creating endless opportunities and possibilities for the use of the ranch. Native wildlife is abundant on the ranch and includes whitetail deer, dove, quail, and turkey; as well as a few introduced wildlife species, axis, blackbuck and red stag. Additionally the bird watching is amazing as the ranch offers sanctuary to a multitude of annual and seasonal birds. The owner has invested a substantial amount of time and money into introducing the best whitetail genetics money can buy. A complete list of releases is available upon request. Domino has a level 3 MLDP. The stunning headquarters house is located on the Western side of the property. This beautiful main house has a nice master bedroom and bath tastefully arranged for ultimate comfort. There is also another bedroom and private bath, and a ½ bath which is located off of the living room area for guest convenience. The home has an upstairs loft with lots of windows to and relaxation areas to enjoy the incredible views of the native landscapes. The home many exceptional amenities including: dish network, and internet, vaulted ceilings, and furnished with country décor. In the yard area, a fantastic patio/pavilion area is the place to be enjoying the South Texas air, complete with a patio house with BBQ grills, and outdoor kitchen. A large covered carport is located right off of the pavilion adjacent to the house. The hunting camp/lodge area has a very comfortable main gathering building/room, which serves as the dining area, and general gathering; offering lots of room to spread out, relax and enjoy some company. Lodging is landscaped and terraced up directly behind the living/dining house; there are 4 bedrooms with a porch along the entire front and entrance to rooms. Patios, decks and walk-ways from the suite of bedrooms descend and meander cascading down below to the outdoor pavilion and camp lodge. The camp/lodge has lots of upgraded features including custom kitchen, tile work and furnishings or western flair, a living room/den which looks out onto the covered patio overlooking a pond and entertaining pavilion to the side. The yard areas are landscaped and the pavilion offers hours of enjoyment to catch up with friends/family or just a place to wind down at the end of a day. A guest suite beside the camp lodge. It is 1BR/1BA, with a living room, patio and walk ways. The exterior area is landscaped and sprinkler watered. This suite is furnished and decorated in comfortable western elegance. The entire ranch is high fenced with electric gates throughout. There are 14 Miles of all weather roads.There are breeding pens that are not currently in service and TPWL MLD permit. Barn and walk-in cooler with roll-up doors, in close proximity to the lodge/camp area. Shooting range in lodge/camp area. Foreman's house - 2BR/2BA, with a porch that wraps around 2 sides of the house. This house is located approximately a mile from camp headquarters. Three bay equipment barn with 3 roll up doors. Vehicle/equipment washing slab, complete with pressure washer. Vehicle/equipment barn: inside the main entrance is an ATV and hunting/utility vehicle parking barn. All existing minerals convey with sale of ranch; exact mineral conveyance to be determined at time of new title commitment. All furniture (aside from a few personal items) conveys with sale of property. 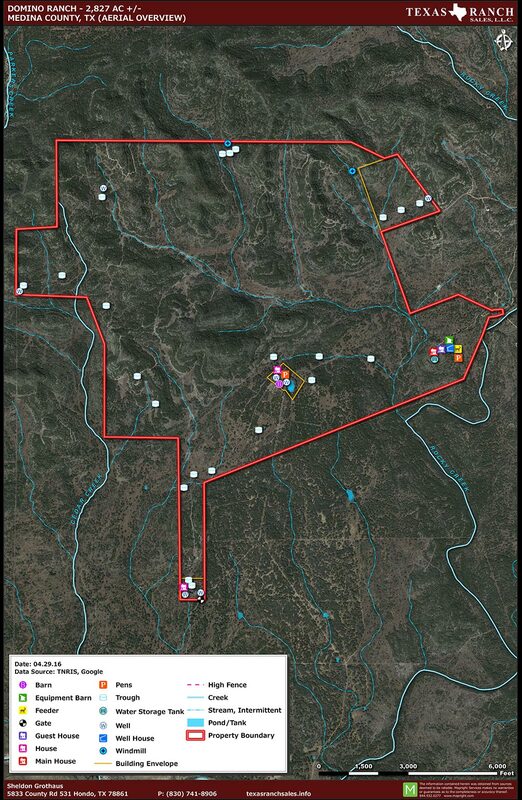 The majority of the property is currently under SAWS water conservation easement. 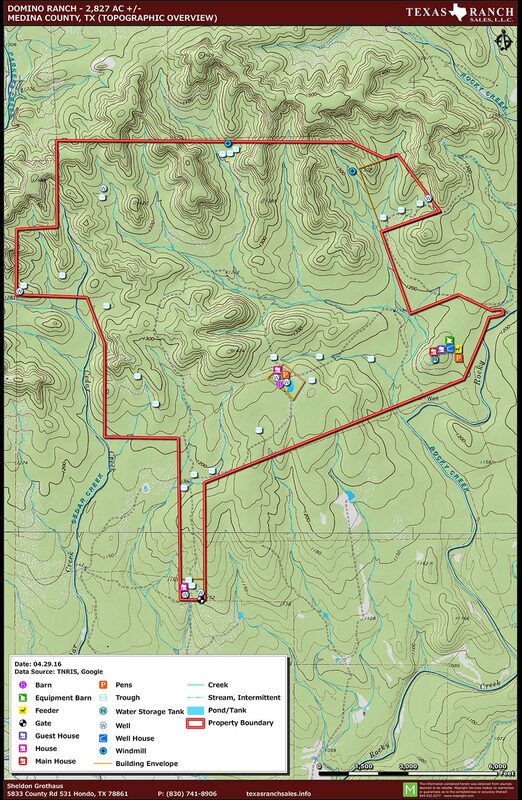 There is approximately 250 acres in two individual envelopes excluded from the easement. There is a possibility of 2 existing employees to go with ranch. This incredible ranch offers an awesome opportunity to own a beautiful, ready-to-go hunting and recreational ranch to a distinguished buyer.